The results of our research: the Full-Carbon/Titanium Ritchey-Chrétien truss telescope. Over the course of many years of diligent and strenuous research, we have achieved in producing the lightest instrument on the market in its class, with unmatched shape conservation and rigidity even under very high mechanical and thermal loads, as well as unfavorable wind conditions. The Ritchey–Chrétien telescope (RCT or simply RC) is a specialized Cassegrain telescope powered by a hyperbolic primary mirror and a hyperbolic secondary mirror designed to eliminate coma. As with the other Cassegrain-configuration reflectors, the RC has a very short optical tube assembly and compact design for a given focal length, usually f/8. It has a large field of view, free of optical errors compared to a more conventional reflecting telescope configuration. Since the mid-20th century most large professional research telescopes have been Ritchey–Chrétien configurations. All of our instruments are built with High Module Carbon Fiber and Grade 5 Titanium Alloy. These materials constitute more than 90% of the telescope. Prior to construction, every single instrument is modeled in Dassault CATIA, the most versatile and powerful CAD-CAE-CAM system existing today. The use of this 3D environment allows us not only to simulate every aspect of the product, but also to generate the CAM output data for our NC machines. All of our telescopes carry a serial number, and exist in 2 different forms: a physical instrument (the one delivered to clients) and a virtual instrument (the one we keep in our database), the latter being a 1:1 replica of the former. This assures for a fail-safe life cycle of the product managed elbow to elbow with the client. Each and every part, built or designed in our facility, can be easily tracked in our database. In addition the implementation of product modifications and custom-made solutions can be discussed and designed with clients in a virtual environment any time prior to execution. 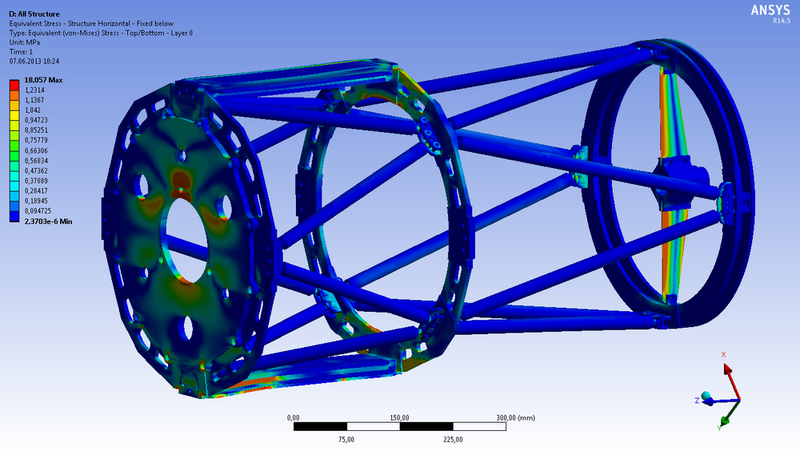 During the design process each single component, as well as the entire assembly, is simulated with Finite Elements Methods (FEM). 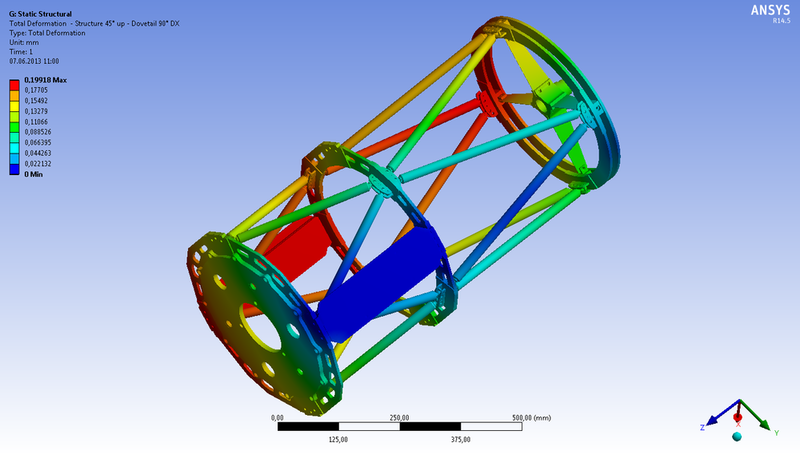 In order to ensure that every physical aspect of the instrument is under control, thermal simulations as well as mechanical, modal and CFD (Computational Fluid Dynamics ) simulations are performed upon every major design modification. The ability to simulate all stress conditions on the telescope, leads to a “perfect” design: a balance between lightness, rigidity, stability, cost control, and beauty. All the materials we use are made in Italy, and every component is fabricated, assembled, and tested in our facility in Berlin. 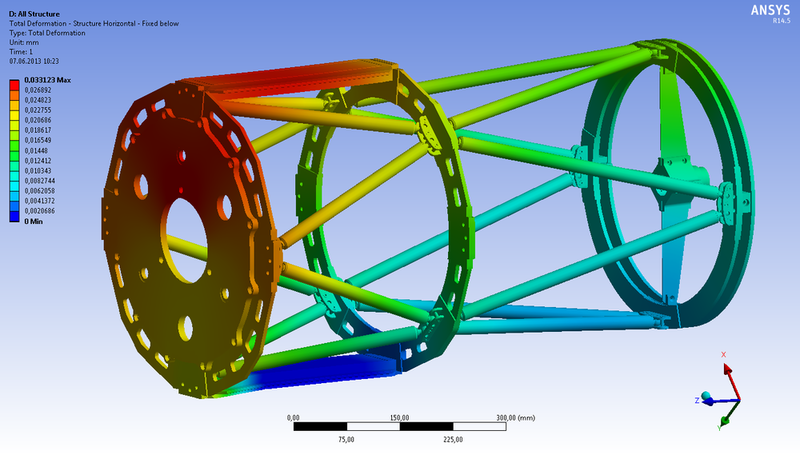 The FEM analysis on the main structure of our "RCM 320 C/Ti" is performed by simulating a load of 100 N (ca. 10 kg) attached to the backplane, which generates a moment with an arm of ca. 200 mm; another load of 60 N (ca. 6 kg) is attached to the second dovetail simulating additional devices (tracking tube, tracking camera, etc.). 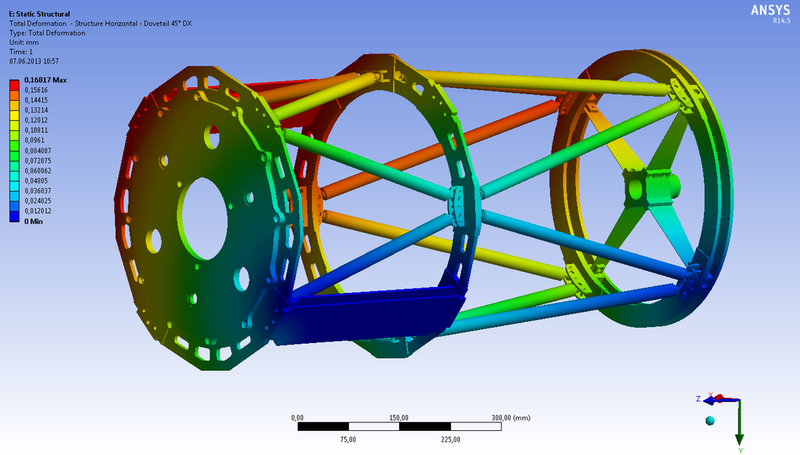 The primary and secondary mirror assemblies in this part of the simulation, a simulation which is already highly complex due to the great number of parts and different types of connections, are simply inserted as external loads placed on their respective anchoring points. As indicated by the displacement values (expressed in mm) shown on the legend at the left of the picture, the structure remains perfectly aligned under all types of stress conditions. The images displaying the stress concentration (Von Mises equivalent stress) clearly reveal how the dovetail, which links the instrument to the mount, is the most stressed component. A substantial torsion moment on this part can compromise the stability of the structure while tracking the night sky. We tested numerous traditional solutions, offered by our competitors, where the dovetails were machined from a single aluminium bar, but the results were highly unsatisfactory: too great a torsion and hence the instrument's misalignment. After many CPU intensive test runs we came up with the idea of combining the properties of carbon fiber with that of aluminum. The result was just what we were looking for: with the hybrid Aluminium/Carbon design, the torsion deformation on the dovetail is reduced to a minimum (ca. 40 times less than a traditional CNC aluminium dovetail rail). 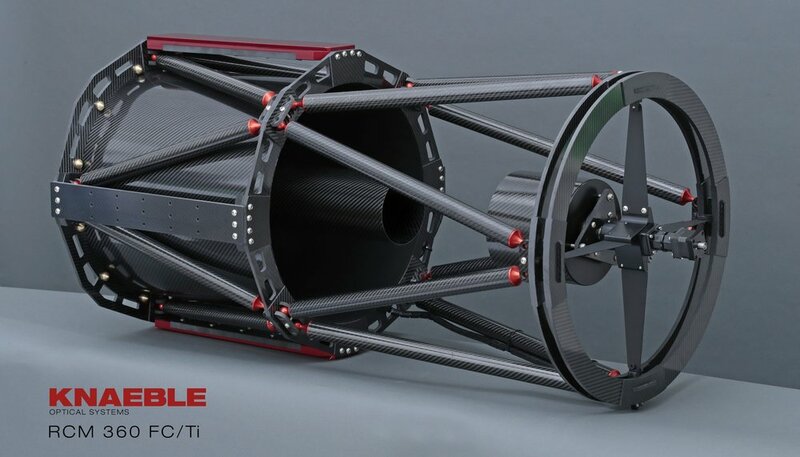 The truss structure of all our instruments is realized entirely in high module carbon fiber plates and tubes. The flat components are exclusively fabricated with 0,25 mm unidirectional pre-pregs, plied with a 0-90 degrees orientation. Whereas in order to achieve the maximum rigidity of our tubes, we ply the layers with single orientation along the longitudinal axis. The components are then cured in high pressure autoclave. The single parts are finally cut into shape with our CNC water jet equipment. The truss structure is held together by our proprietary CNC titanium joints. The cells that we build for our primary mirrors are usually 9 or 18 points computer optimized mechanical-cushion systems. They are entirely build with light yet sturdy Hi-Module structural carbon fiber components. 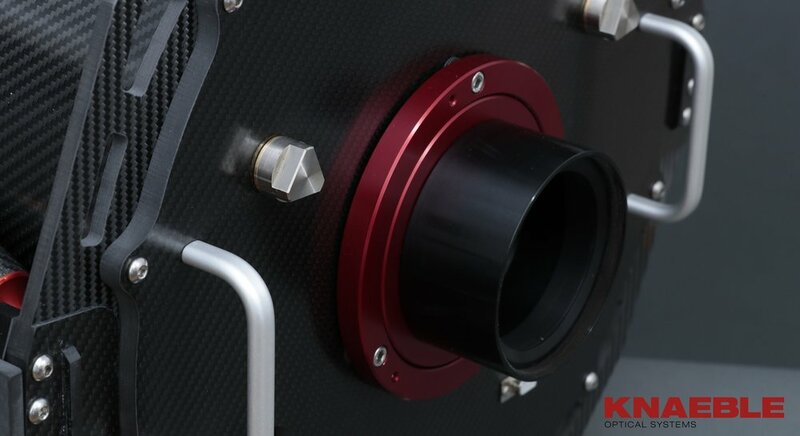 This material has zero thermal expansion as well as incredible mechanical properties: the 10 mm thick carbon fiber plate that we use for the backplane of our 320 mm RC reflector behaves similarly to a 40 mm high strength aluminum alloy plate, with only about 1/7 of the mass. Although it is possible to fabricate high grade optical aspheric mirrors – the Ritchey-Chrétien being the most difficult to realize – of exceptional quality, each and every mirror is a unique piece, differing slightly in thickness, diameter and curvature. A standardized cell construction, where the optic has to match the cell configuration and not vice versa, would inevitably lead to astigmatisms. Therefore our proprietary 100% carbon fiber cells are designed and realized to match the characteristics of every optical set that we install, so as to make the optics rest “nice and comfy”, free of any inducted stresses but absolutely immobile in their “nest”. 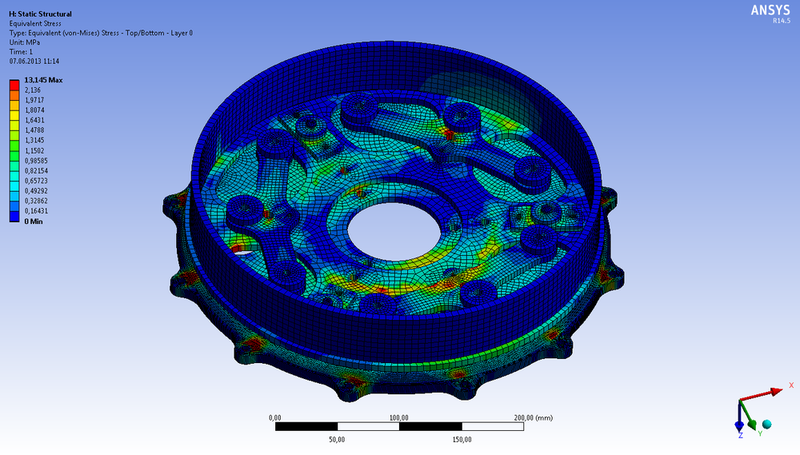 The cell design starts with the optimization of the contact points Mirror/Cell. We do this by plugging the main constants of the imaging system (main mirror thickness, diameter, central hole, central obstruction, etc.) 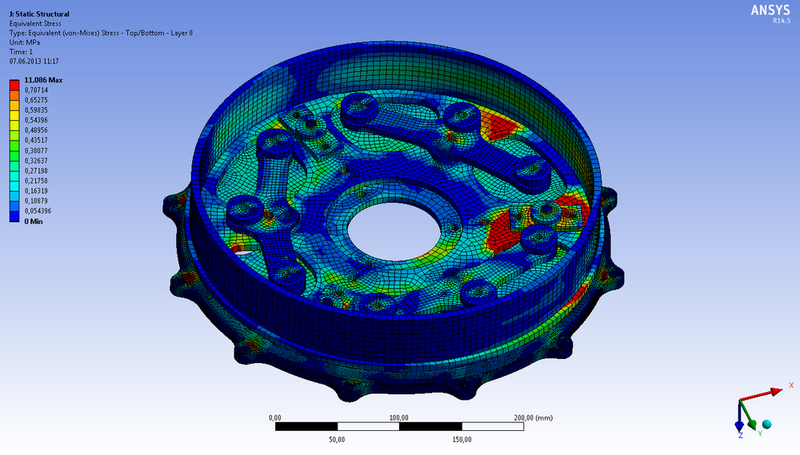 into our algorithm, using the Finite Element Methods. This results in an optimal distribution of contact points and mechanical stress on the mirror. Please explore the FEM analysis results of the primary mirror cell. The Z axis corresponds to the longitudinal axis of the telescope. The values obtained above are then transported into our CAD system, where a 3D model of the cell ready for the Finite Element Analysis (FEA) is built in every detail. After a successful physical simulation, the cell is fabricated with our CNC machines and finally assembled. 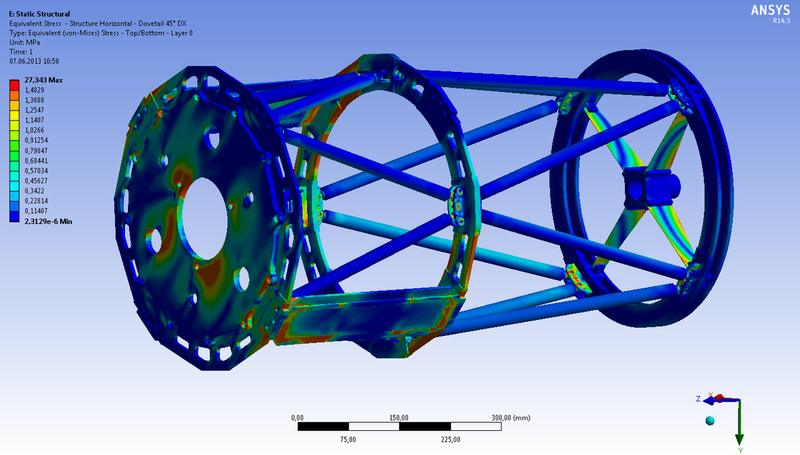 A final mechanical test on the fabricated assembly is then compared with the FEA results.